Air in Berlin Hotel i Berlin, Tyskland: Bestill nå! The legendary, 3 star Air in Berlin Hotel, with its beautiful art nouveau facade, offers elegance and comfort in the German capital. 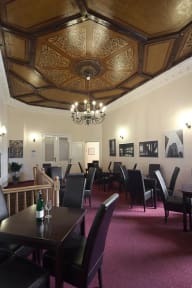 Despite being in the centre of the city, the Hotel Air in Berlin is very quiet and offers a peaceful respite from the adventures of exploring Berlin. The hotel has an outdoor terrace, a bar as well as parking facilities. 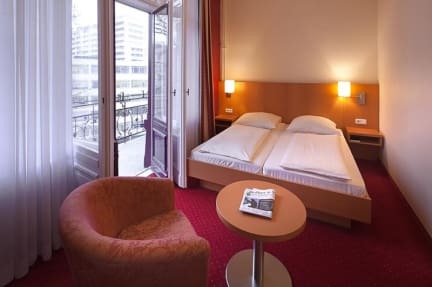 If you wish to visit other sites in the city, Hotel Air in Berlin is conveniently situated just 200 meters from Wittenbergplatz, where various underground and bus lines converge. All the major attractions can be reached within minutes! Situated directly in the centre of the city, all of the main sights are on your doorstep. The impressive and semi-destroyed Memorial Church, the famous shopping street Kurfürstendamm, the tremendous Tiergarten Park, as well as the Zoo. Everything is just a few minutes on foot from the hotel. Our rooms are all fully furnished with minibar, telephone, TV, wc / bath or shower, hairdryer and radio. Internet access is available. Breakfast not included - 9.00 EUR per person per day.